Police have detained 17 more suspects connected to a chemical blast in eastern China last month which killed 78 and left hundreds injured, local authorities said Monday. The explosion in eastern Jiangsu province was one of the worst industrial accidents in the country in recent years and led to the closure of the plant. Police have taken “criminal coercive measures” against the 17 suspects, said the Yancheng city government on its official Twitter-like Weibo account, bringing the number people rounded up over the blast to 26. The latest group includes individuals from an unnamed third-party organisation, who are accused of falsifying project evaluations, and Jiangsu Tianjiayi Chemical company, whose plant was involved in the blast. 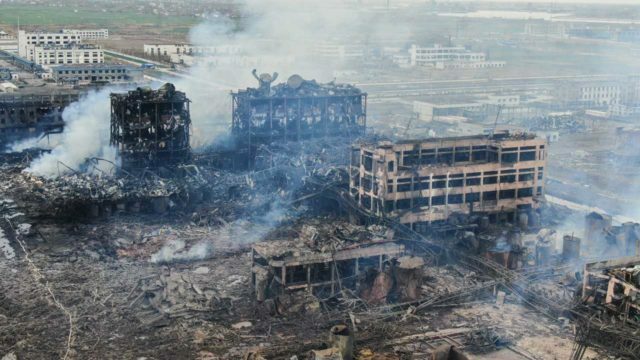 In 2015, massive chemical blasts in the northern port city of Tianjin killed at least 165 people.